Vintage Cameo silverplated collectible souvenir spoon featuring the OLD MISSION at SANTA BARBARA colorful depiction encased in a clear round Lucite dome to mimic an item under glass. 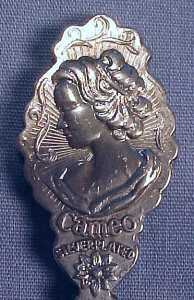 This vintage silverplate souvenir spoon was made in Australia by Perfection Plate. Excellent condition with no damage to note. This ornate handled spoon features flowers and scrolls surrounding the center dome, and on the back, a relief of a cameo with scrolls and a flower. Very detailed and lovely - you will not be disappointed! 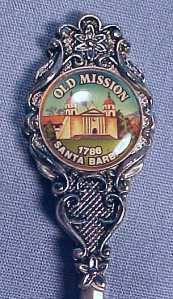 The Santa Barbara Mission was established on the Feast of Saint Barbara, December 4, 1786 and was the tenth of twenty-one California Missions to be founded by the Spanish Franciscans. This vintage silverplated souvenir collectible demitasse spoon with a colorful depiction of the Old Mission at Santa Barbara encased in a clear Lucite dome would be the perfect special silverware or flatware piece to use as a tea spoon, flavored coffee spoon, an espresso spoon, a cappuccino spoon and even as a hot chocolate spoon! This souvenir collectible spoon measures 4.5" in length, weighs .4 ounces and is marked on the back of the spoon with CAMEO Silverplated and along the back of the handle with PERFECTION PLATE MADE IN AUSTRALIA.